horizontally on the inside of an exit door roughly 40 inches up from the bottom of the door. When the panic bar is pushed, the latch releases and the door opens outward. This mechanism allows for a door to be opened quickly and easily when a panicked crowd presses against it in an emergency situation. Without a panic bar, a crowd may find it impossible to escape because the door would be too difficult to open inward. To serve its purpose effectively, this device must always open away from the side of the door on which the panic bar is mounted. 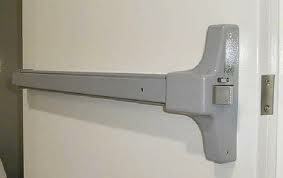 A panic bar can be used on single or double doors made of wood, steel, aluminum, or even glass. Typically, a door with a panic bar can only be opened from the inside, but when a panic bar is used on a two-way door, a different type of handle must be mounted on the outside. Panic bars are required by law on all fire and emergency exits. The panic bar on a fire rated door must be able to withstand high temperatures and must latch every time the door closes. The panic bar on a non-fire rated door, on the other hand, may be temporarily unlocked by using a dog down key. When in this unlocked mode, the door can be opened by pulling or pushing on the door itself, not on the panic bar. Panic bars can also be found on chain link and decorative fence gates, particularly in large outdoor venues such as open air concert arenas and sports stadiums. While a surface mount panic bar may be installed professionally, installation can also be completed by the ambitious do-it-yourselfer. Many different types of standard and deluxe panic bar kits with comprehensive installation instructions are available for purchase. These kits include all necessary mounting hardware, fasteners, adjustable receiving latches, and optional lock boxes for outside keyed or card accessed entry. fixed horizontally to the inside of an outward-opening door. When the lever is either pushed or depressed, it activates a mechanism which unlatches the door allowing occupants to leave quickly from the building. By the end of the 20th century, most countries have building codes (or regulations) which require all public buildings have a minimum number of fire and emergency exits. Crash bars are fitted to these types of doors because they are proven to save lives in the event of human stampedes. Panic can often occur during mass building evacuations caused by fires or explosions. In the event emergency exits are required, the crash bar works efficiently to allow people to pass through security doors without a reduction in speed. A crash bar’s fast-acting mechanism reduces the risk that a rushing crowd might suddenly become a logjam at the exits. This situation, which has many historical precedents, can cause falls, crushing and injury because the rear of a crowd has no idea that the people at the front of a crowd have come across a door. Crash bars are typically found on doors which are required emergency exits serving a particular type or quantity of occupants. Common locations include doors which provide egress from assembly areas, doors which serve many occupants, or doors serving hazardous areas. For buildings subject to the International Building Code, or a locally adopted variation, they are required for certain healthcare, education, or assembly spaces, generally related to the number of occupants exiting through a given door. A door intended only for exit doesn’t need a handle on the outside, and for security, an outside handle is often omitted. 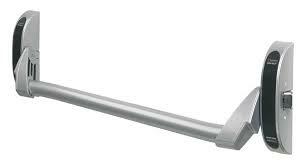 However a door handle can be mounted on the outside to create a two-way door. This allows the bar to be locked in a neutral (latch open) position, allowing the door to be freely opened from either side.